Japan, 1990, 119 minutes, Colour. 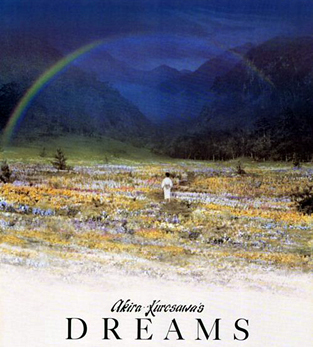 Akira Kurosawa's Dreams is a master work from the celebrated Japanese director. Kurosawa made many Samurai dramas in the '40s, '50s and '60s. His celebrated films include Rashomon, The Seventh Samurai, The Throne of Blood, Red Beard. During the '70s and '80s he made fewer films - though all of them were striking, ranging from Dodes'kaden to Dersu Uzala, Kagamusha and Ran. Kurosawa was not only an expert film director, he was also an artist. This is evident in his Dreams (made at the age of 80). In one of the stories, the Japanese enters into a Van Gogh landscape, pursues the artist himself and experiences Van Gogh's sensibilities. The film is something like this - we are invited to observe moving pictures in Kurosawa's gallery and he invites us in to share his sensibility. He touches on Japanese legends, Japanese art styles, Japanese customs. There are beautiful pictures of peach blossoms and humans miming peach blossoms. There is a child who watches the wedding procession of the foxes. There is a beautiful finale with a village and a procession of joy and hope. In between are stories which are much more serious: mountain climbers being lulled by a charming vision into death - which is then unmasked as a vision of cruelty; a Japanese soldier going through a tunnel and reliving his war past; some warnings about nuclear destruction. The film is not made for the moviegoer in a hurry. Rather, we are invited to share Kurosawa's sensibility and share his dreams. 1. This film as a climax in the career of Akira Kurosawa? The focus of his films, his Japanese sensibilities? The painter? The man of action? The man of ideas and sentiment? 2. The overall effect of the collection: delight, charm, gloom? The messages? The simplicity of the messages - some simplistic? The legacy of an old man? 3. The impact of the colour photography, the compositions, the movement and mime? The creation of a dream world? The special effects? Photography angles, tableau? Beauty? 4. The Van Gogh story and the parallel with the audience watching this film? A gallery of moving pictures, watching them, entering into them, pursuing the artist, experiencing with the artist? 5. The nature of dreams: image logic, lack of logic? Archetypal stories? Dreams as aspects of the self? Messages, fears, facing fears and dreads, hopes and vision? 6. Sunshine amid the rain: the images of rain and sunshine, the Japanese village, the little boy and his mother, her beckoning him in, the story of the foxes, his going into the forest, the beauty of the mime and the procession, the music and the pauses and the poses? The foxes and their wedding? Humans not allowed to see? His going back, his mother's severe story, giving the offering for the foxes? Or death? His going to give the gift? 7. The peach blossoms: the beauty of the orchard, the children, the little girls at home, the boy and the missing visitor, his vision? Watching the peach trees and the blossoms, the pageant of beauty? The people and their costumes and make-up as the peach blossoms? His delight, his tears? The girl as the tree? 8. The blizzard: the slow motion photography, the snow, the climbers trying to move through the blizzard, the temptation to lie down and die, the darkness, the loss of time, the soft snow, the vision of the woman caressing and soothing, her hair blowing in the wind, the transformation into a sinister figure of evil, reacting against death? Waking up, the vision of the mountain peak and the achievement of the climb? 9. The tunnel, the soldier, the fierce dog with the hand grenades? The private going through the tunnel, meeting the dead, hearing his story, the platoon, the confrontation of the evil symbol of the dog? 10. The field of crows: the Japanese artist, admiring Van Gogh's pictures, the gallery, the beauty, the women doing the washing, the picture transformed into life, Martin Scorsese as Van Gogh, his bandages, the cutting off of his ear, his explanation of painting, walking through the fields, the artist following him, immersed in the flight of the crows? 11. Mount Fujiama and red: the chaos, the nuclear disorder? People fleeing, people crushing each other, the reflections on scientific development, the disaster? The warning? 12. The demon: the man on the desolate field, confronting the demon, what had happened with the world? The nightmare? The destruction? 13. The peaceful village: the windmills, the tranquillity of the stream, the old man and his messages, the simplicity of conservation, harmony with nature? The beauty of the procession? A finale for Kurosawa's Dreams? 14. The actor as identifying with Kurosawa? In the various stories? Kurosawa's own experiences? His memories? Fears, regrets, hopes? His legacy for his viewers? The work of an aged man?